Following two consecutive packed-to-the-rafters Edinburgh Fringe runs at the Free Fringe with ‘Mind Games’ in 2016 and ‘Awaken’ in 2017, and fresh from filming a highly anticipated Channel 4 special (TX between June and September 2018) Aaron Calvert, is heading back up to the Fringe, this year to the Gilded Balloon, with his new show ‘Declassified’. Having originally trained in medicine at The University of Nottingham Medical School, Aaron soon traded his white coat, for a sharp suit and took to the stage. 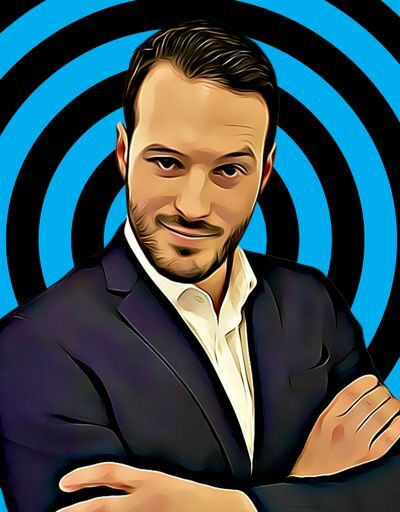 There he has found ever growing success combining his exceptional skills in hypnosis, magic and mind reading to bring audiences a show they’ll never forget. 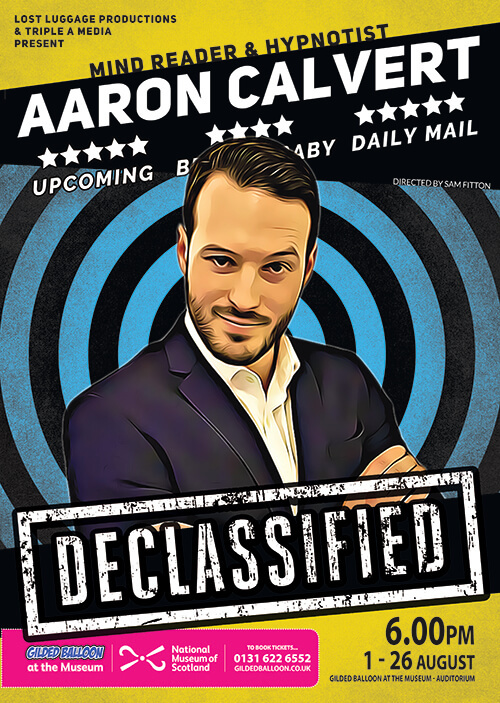 This is a genuinely unique fusion of mind reading and hypnosis – Aaron takes his audiences on a thrilling journey as he showcases capacities of the human mind that most people will have hitherto been entirely unaware. ‘Declassified’ tells tales of human feats which redefine the concept of mind over matter, such as the story of Angela Cavallo, who saved her son’s life by lifting a car and holding it for five minutes. Aaron coaxes audience members out of their comfort zone, then, through a series of interactive demonstrations, he begins to reveal that the boundaries of what every day people are capable of are so much more than we usually believe. From mind-bending displays of extraordinary strength, to knowing exactly what someone else is thinking, audience members will be invited to awaken their hidden abilities. ‘Declassified’ is so named because it is, in part, inspired by the true stories of declassified events such as the CIA sanctioned mind control program MKUltra which ran through to the 1970’s. With inspiration from genuine government backed experiments, urban legends and other true stories, Declassified explores just what the human mind is capable of. Aaron’s passion and focus make a distinct departure from ‘traditional’ “cluck-like-a-chicken” comedy hypnotism, moving away from the slightly disreputable shows of old, adding high level production values and bringing a wealth of knowledge, skills and sense of humour in order to create a fresh new, innovative, interactive and of course, hypnotic form of entertainment. Aaron’s aim is for audiences to leave feeling empowered, exhausted, maybe a little dumbfounded, but ready to do it all again. ‘Declassified’ is co-written & directed by Sam Fitton – a national award-winning magician, magic consultant & fellow Edfringe Performer. Sam and Aaron’s partnership has been at the core of all of Aaron’s Edinburgh shows and they constantly strive to sharpen and polish each show to be the best performance yet. A truly interactive hour, Aaron shows us all that we have the potential to achieve the impossible, and wraps it all up into an hour of unlimited entertainment.